This is designed by Eric Gjerde, a wiz in Origami Tessellations. It’s so nice how the light reflects with the plastic, as if the water took over the place and the paper thing is just floating there upright like, what? Well, strong winds and rains fell upon the Philippines the time I took this picture, so I shouldn’t be surprised about our house being a temporary water world, but apparently, I overestimated the height of the side of the block where my place stands, which appears to be the highest point in the block. 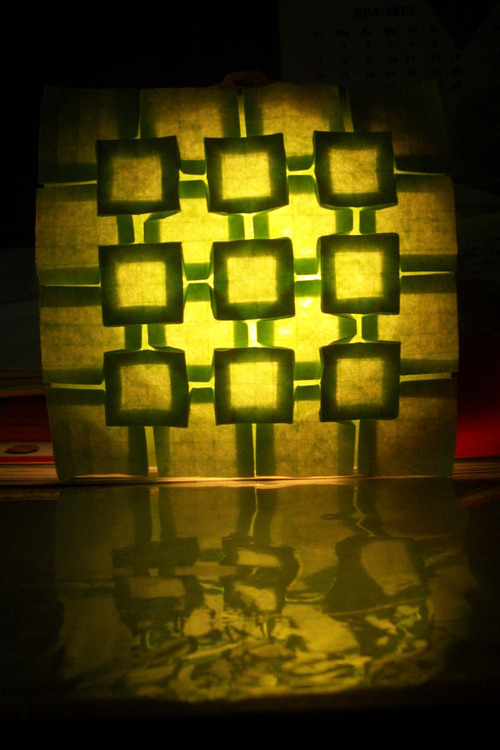 Anyway, when there is no light at the back of the tessellation, the object looks less exciting. Just think of a folded piece of paper with many beautiful shapes overlapping each other. The diagrams are in the book “Origami Tessellations” by Eric Gjerde.